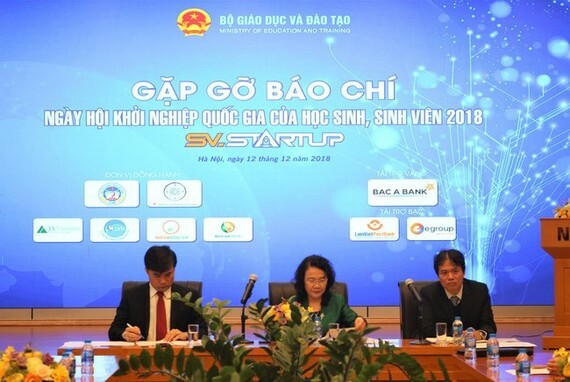 Deputy Minister of Education and Training Nguyen Thi Nghia said the festival aims to inspire students to dream and voice their startup ideas and then call on businesses to invest in them. Nearly 80 projects in science-technology, business, finance, education, healthcare and agro-forestry-fisheries will be on display. Seminars and forums on supporting student entrepreneurship amid the fourth industrial revolution, scientific research and startup incubators in tertiary education establishments will also be held. A highlight of the festival will be the competition “Students with startup ideas 2018”. Launched in September 2018, the event has attracted nearly 200 entries from more than 200 high schools, colleges and universities, mostly in technology, education, healthcare and social affairs. The 15 best projects have been listed for the final round scheduled for December 16. For students’ projects, first prize will include 100 million VND (4,300 USD) and support from investors while 70 million VND will be granted to the second prize and 50 million VND to the third prize. The first prize for high school students will be worth 50 million VND while the second and third prizes will value 30 million VND and 15 million VND, respectively.